Tech Talent is an annual event hosted by Sunderland Software City, to attract some of the NE’s undiscovered tech talent. Last Thursday, 25th May, we exhibited at Newcastle’s Crowne Plaza to talk with local talent and to ensure they know who we are and what we’re about. The North East is a pretty great region for tech, so we were rubbing shoulders with the likes of Tombola, Scott Logic, Leighton and Opencast. It was great to see what other companies have on offer, chat about their efforts in the region and share knowledge in the tech community. We spoke to a real mix of potential candidates, from students through to industry professionals and those who wanted a complete career change. Our goody bags and drone footage certainly drew in the masses and we spoke with some really promising talent who will hopefully be applying for some of our current vacancies. It was also inspiring to see what other companies in the region are doing to attract and retain talent, boost employee engagement and how we’re all working to get the North East firmly on the map as leaders in tech. Education around tech subjects is increasing rapidly within the region, and there are lots of exciting ways we can grasp and help to cultivate this. The prospect of degree apprenticeships is really exciting, especially as tech is becoming a lot more specific within companies – it’s a such a good way to grow talent within our company and nurture a fantastic workforce. Our Summer Placement Initiative is a great example of supporting development and growth within a thriving business. We also learned that we’ve got it pretty good here at Bede, many of the exhibitors and candidates were inspired by our work environment, ethics and culture …we may have even had a few converts from some employer competitors! Joe Saumarez Smith, chairman of Bede Gaming, was a guest and roundtable chair at EGaming Review’s Power 50 conference in Marbella, Spain. He reviews the two day conference. The Power 50 is one of my favourite online gaming conferences and not just because it is held in sunny Spain. The relatively small number of attendees and the fact most are the major decision makers within their companies is a big plus. It also means that in discussions people are more willing to share their experiences and admit what is going badly for them, as well as what is going superbly. Unsurprisingly, the two main themes of this year’s Power 50 were what is happening to online gaming regulation and the potential opening up of the US market. Regulation and in particular the need to ensure that Responsible Gambling measures are put in place by all operators was a particular theme across almost every panel and roundtable. The recent UK Gambling Commission fines were widely discussed and there was a general surprise that no operator had yet lost their licence. Over a couple of drinks later in the evening I heard that there is a £10 million plus fine for a household name in the offing, which will certainly cause some big problems for the overall industry. The imminent announcements around PASPA – which at the time of the conference had not been announced but of course is now the main topic of all conversations – was something that was widely discussed. While most operators were excited about the prospect – especially those who already had businesses operating in New Jersey or Nevada – there was also a feeling that if PASPA was repealed that it wouldn’t be as simple to make money in the US as many commentators would be expecting. Some of the more experienced (or should I say cynical or realistic?) operators were concerned about the potential high levels of protectionism against European operators coming into the market but their greatest concern was the likely level of taxation. Most states seem to be expecting an enormous payday from sports betting and have very little idea about what the correct level of tax should be to allow for a competitive product. Talk was of multi million dollar licence fees, $20 million security bonds and tax rates similar to land-based casinos (mid 30% and upwards) which would make sports betting economically unviable. Add in the sports leagues’ desires for an integrity fee and it starts to get hard to see how anyone is either going to have a decent product or make any money. I chaired two sessions of roundtable discussions about how the online gambling industry could improve its public image. Surprisingly they were two very different sessions. The first group agreed that the industry has a massive problem with society’s general perception of online gambling (and gambling altogether) while the second was more bullish, saying that the industry was going through a bad patch but that society needs to accept that gambling is a legal activity that pays high taxes and that it is better that it exists in full view rather than as a black market. There was a bit more of nuance to the arguments than that but the opinions did strike me as being quite different, depending on the individuals in the room. It would be pushing it to say that we agreed on a way to radically improve the industry’s public image but there was a feeling that in the UK in particular there is not a single person to whom the media can come to who represents the industry in a credible way. That person could acknowledge that gambling is a ‘sin’ industry but that it is better that it is taxed and highly regulated and that for a large percentage of customers gambling is a fun pastime which does not negatively impact them. However for the small number of people who have problem gambling then the industry should be showing that we support addiction programmes and that we do everything we can to stop them from developing those problems further and to stop gambling. How the industry finds and funds that person was not something we tackled in the hour long sessions but there did seem to be an acknowledgement that it would help a lot to have that person in place to represent the industry. As ever, the Power 50 was brilliantly organised and I regret that I was not able to represent Bede Gaming better in the Annual Online Gambling Hill Climb Cycling Challenge over a 11km course, where I could only manage second place, 12 seconds behind David Shapton of Akur Capital. Head of Partnerships, Mark Rehorst-Smith, gives his take on this year’s SiGMA. SiGMA, “Summit of iGaming Malta”, now in its third year, was bigger this year than ever before, with the show being a focal point for the flourishing iGaming business out there. It was great for Bede to attend and catch up with a number of our existing suppliers, along with exploring some new opportunities both B2B and B2C. The variety of products available on the content side was encouraging, with a mix of both innovation on existing verticals and also the evolution of streaming content. It’s proving to be a good place to see developments in gaming content and to keep in touch with suppliers at the forefront of the industry. This conference is definitely one, where we’ll be looking to put in a regular appearance. 2018 will see us pushing Bede PLAY – our content aggregator platform, which offers operators industry-leading marketing tools with which to achieve their digital ambitions, rapidly – and as we continually grow the quality of our content, both in terms of suppliers and innovation, it’s important that we’re making the right partnerships and SiGMA is a fantastic platform to do that. So we’ll see you in Malta next year for sure, but in the meantime, feel free to contact us to talk content, products and partnerships. We’ll definitely be able to help. Why the situation in Germany is unlikely to change in the near future. For those in the gambling industry who only want to work in regulated markets, Germany has been a frustrating country. There have been several regulatory false dawns and I shudder to think how much lawyers and consultants have made out of the shenanigans around the various on/off licensing sagas. Meanwhile operators like Star Games and Bwin have been making a fortune from German customers. On the legal front it only gets messier. While it looked like the 16 Länder had finally agreed a workable interstate treaty on sports betting, which would have come into force on 1 January 2018, Schleswig-Holstein blocked it on the basis it does not incorporate legislation for casino and poker. They instead said they would prefer to reintroduce the legislation that saw them licence 23 online casino and 25 sportsbooks in 2012. Meanwhile, the German tax authorities have written to all the big operators, reminding them to make sure they are paying VAT at 19% on their gross gaming revenues since 1 January 2015. According to my market sources, almost everyone has complied, which means that the vast majority of the German online gambling market is now effectively paying tax on their not entirely legal revenues. When the tax authorities of Frankfurt am Main III (online sports betting) and Berlin Neukölln (online casino) bank those payments, is that a tacit admission that the federal government is effectively giving permission for European operators to take money from German customers? At the same time financial markets’ appetites for light grey revenues seems to be growing, with revenues from countries like Germany and Sweden only moderately discounted to fully regulated markets and even profits from places like Japan and Norway attracting decent multiples. Speaking to chief executives of some big operators and software companies who have until now stayed out of Germany, it appears that their patience may finally be cracking. Earlier this month (Oct 3) Scientific Games took Germany off its banned list, although that perhaps was more a reflection of the fact that once they acquire NYX OpenBet it will have some fairly substantial revenues from what must now be Europe’s second largest online market. I am expecting several other big companies to open up Germany as an acceptable market over the next 12 months. What are the consequences of this? For Germany’s tax authorities it should mean a decent payday. Likewise for their media companies, who also seem to be a lot happier about the risks of taking advertising from gambling companies. But what will the politicians and legal authorities make of it? It feels like the gaming operators are hoping that Germany goes the same way as Sweden where, slowly but surely, a very light grey market becomes taxed and regulated. But this is by no means a certainty. A large number of the states are extremely conservative in their outlook and are particularly opposed to any increase in access to slots and table games. Sports is less of a problem, not least because thanks to the likes of Tipico, there are betting shops on most high streets and footballers, like Oliver Kahn, advertise sports betting on national television. Casino and poker are definitely not certainties to make it through the licensing process. For the next couple of years, it doesn’t look likely there will be huge changes from the current situation. But as more operators enter the market, the push for a fully taxed and regulated market – by both operators who want to fully legitimise their revenues and by politicians who don’t like companies operating outside the law – can only become greater. Written by Joe Saumarez-Smith, Chairman Bede Gaming, for EGR Intel. The original can be found on their site at http://egr.global/intel/opinion/playing-the-long-game-in-germany/. This article is printed with permission from EGR. Gaming Platform: To Buy or To Build. Is these the only options? Operators have long struggled with the question of whether it is best to buy or build their technology, but perhaps this is the wrong question to ask. There is an alternative. How an operator accesses the best products and technology to deliver a great user experience has changed in recent years. Around six or seven years ago, the vast majority of operators opted to licence their technology from third party suppliers, recognising the need to outsource due to lack of internal expertise. However, as many operators selected the same technology partners, many ended up looking like clones of one another and lacked the ability to differentiate. Providing tailored solutions for individual operators was neither cost-effective nor technically viable for many platform providers. Instead, they provided a one-size-fits-all option to each brand, placing the onus on them to ensure their marketing and not their product proposition was what made them stand out from the crowd. With costs rising, some operators decided to take their technology in-house. These projects have produced somewhat mixed results to date. Some have seen success, but the majority of these have been private businesses who can commit significant budget and have focused on a particular vertical, like sports, for example. In most cases, however, operators cannot make the sort of commitment required to construct a platform equivalent to that produced by a dedicated third party supplier. Operators have more pressing priorities and focus their expertise in other areas, on which their businesses rely. At Bede, for instance, the last 6 years has been dedicated to building the most flexible solution in the industry. It’s hard to shortcut this, especially if you’re looking for a quality product as opposed to a quick fix. However, this isn’t to say that operators shouldn’t look at building a platform as an option. Indeed, it is crucial that suppliers do not ignore the compelling reasons for operators to build their own technology, particularly in Europe’s mature markets where thin margins put additional, and sometimes heavy, pressure on internal efficiencies. And this is where we’re saying there is an alternative route. One that allows operators to build their own functionality on top of a flexible and open platform. That delivers a differentiated proposition without sacrificing quality or refocusing critical business resource towards lengthy in-house projects. It is vital that operators look at the technology that is now available and understand that they can use it to take back the control they’re looking for to deliver their own digital objectives. Delivering a future-proof alternative to an existing legacy platform is perceived as a risk, particularly among major PLCs whose board and shareholders are under a lot of pressure to maintain growth. In this case, it’s almost always easier to go for the safe choice but that doesn’t necessarily make it the right choice. And with aggressive challenger brands making their presence felt, operators that prevaricate could find themselves at risk of losing market share. This alternative approach allows operators to license a high functioning platform and also have the power to build upon it, making the technology act as the enabler to differentiation, choice and control. All this is to say that the divide is no longer as black and white as it was those six or seven years ago.The technology is now available, and accessible, for future-proof alternatives to the static legacy platform options. Some Tier 1 operators have taken the plunge and immediately reaped the benefits. It’s no secret that the likes of the Rank Group, who switched to Bede in 2016, has seen digital revenues soar since. This example shows the importance of ensuring that technology does not act as a roadblock for delivering a stronger product and experience to customers. With an open, agile and proven platform upon which operators can build, they are free to focus on what they are good at. So, if you are struggling with the buy or build conundrum, it might be worth considering that you really can have your cake and eat it. To create a truly differentiated unique offering, the question should not be not whether to buy OR build but where you can buy AND build. As seen in the October 2017 issue of Casino International. 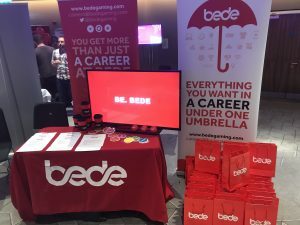 Bede Gaming, the award-winning supplier of software to the online gaming industry, is continuing to build on its partnership-led approach by holding a client and key supplier day. Bede Gaming is building an alternative route for operators, that gives them the flexibility to build their own differentiated offering on top of an established and high performing platform. This approach has been at the core of its business and appeals to a whole range of clients; from those looking to migrate platforms to those looking for a full white label. The provider’s commitment to pursuing true partnerships with its operating partners is reflected in its approach to holding regular dialogue with its clients about its platform and how its use and are now going a step further with an upcoming VIP client day. The latest initiative in its quest to offer the highest levels of service and responsiveness. To be held from 27-28 September, Bede will be hosting a forum and feedback session for its clients at its headquarters in the heart of the North East, Newcastle, before treating them to a fine dining experience and the British Masters golf tournament at nearby Close House. Michael Brady, CEO of Bede Gaming, said: “At Bede we have built our success on a foundation of treating our clients and suppliers as true partners, and ensuring that we take their feedback into account is a core part of our long-term growth strategy. “This is the first, in what we hope will become a regular date in the calendar for all our partners. Founded in 2012, Bede Gaming employs the latest in modern technology to provide secure, high-quality products to create a world class gaming experience. Totally Gaming interview CEO, Michael Brady on his thoughts on the online bingo sector, where he urges the industry to adapt. The Days of Doing “What has Always been done” are over. While the online bingo sector is at something of a crossroads, there are some interesting new developments on the horizon. Totally Gaming: How would you assess the state of the online bingo sector in 2017? Michael Brady: I think it’s at a bit of a crossroads. The days of doing what has always been done are over, and those that stand still will continue to lose market share. There are obviously regulatory and taxation headwinds which we need to battle, but there are some good things happening and some promising developments on the horizon. There is plenty of potential for growth not only in the world of bingo and slots, but in adjacent sectors like lottery, which has been a missed opportunity to date. TG: What were some of the key issues that arose during your panel at the Online Bingo & Slots summit? MB: I think one of the main takeaways was the pressing need for choice. Choice for players and choice for operators in order that they can provide it. So much of what has gone before has been ‘one size fits all’, rigid and inflexible. But players aren’t all the same and the technology that serves them has to be adaptable to their different requirements. It’s something that the industry is really starting to think about: the power to differentiate is so important now and having access to platforms – like Bede’s Hub and Play – that give that control back to operators is an essential part of any digital offering and will be even more so in the future. TG: What are the main challenges currently facing the online bingo sector, and how is Bede Gaming working to overcome those hurdles? MB: I think regulation is biting and will continue to bite for some time to come. Advertising and the way that is changing is also a challenge for everyone involved on the player-facing side, with knock-on effects for suppliers like us as well. These are things that need to be met head on, with innovative solutions being found to protect not only the vulnerable, but the viability of the industry too. There have also been big changes in player attitudes and demands in recent times. That is bringing about new market realities, including the need for better player data acquisition and the better implementation of that data. This, in particular, is where operators with cumbersome, outmoded legacy technology are struggling. TG: What would you say to those operators who still believe online and land-based bingo are rival – and not complementary – sectors? MB: It’s probably not for me to tell them anything, as their customers will do the talking for me. In fairness, there aren’t that many around who still have these very defined sectors, but those that do are missing out on a whole lot of opportunities. Those that have got an omni-channel solution can still do an awful lot more. The challenge for all of us is to harness the technology available to drive innovation and find better ways to leverage some of the great brands we have in this industry. TG: More generally, was the Online Bingo & Slots Summit a successful event? MB: Yes, I thought so. There was a good mix of people there from both within the sector and external to it, which always brings about lively debates. It’s always good to get different perspectives on the same issues and challenges. I think there’s a recognition that with the right mindset, technology, and desire to innovate, we can all move forward and provide a far more satisfying user experience for the players.